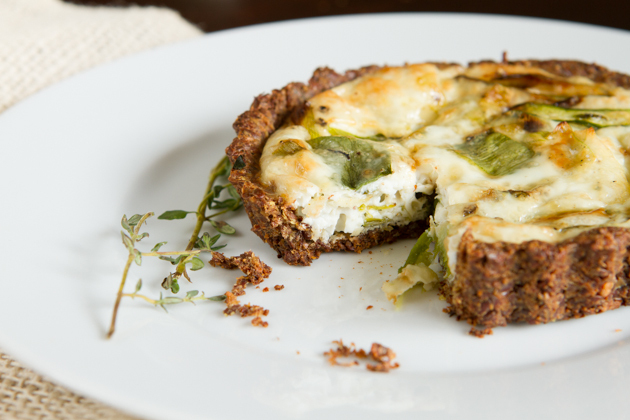 Paleo quiche with a nut-free, grain-free crust. 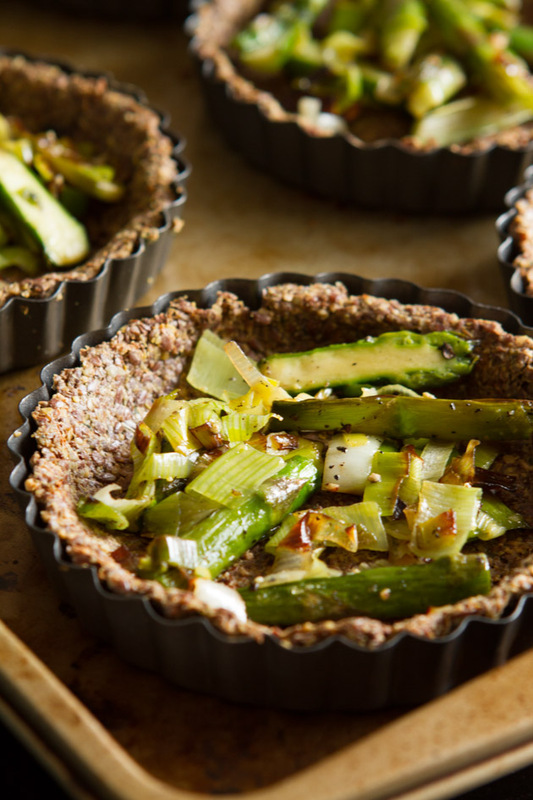 Filled with roasted organic asparagus, organic leek and free-range eggs. Pure, simple, good. I grew up disliking quiche. The whole concept of cooked eggs in a pie crust just didn’t do it for me. It wasn’t an omelet, it wasn’t pie… and we ate it a lot. Let’s just say, in the 11 years I’ve lived out of my parents’ home, I’ve never once missed it. When Healthful Pursuit reader; Cat, contacted me to tell me that my grain-free cracker recipe made the perfect base for quiche, I was a bit reluctant to give it a try. The one major thing I’ve learned throughout my pursuit of a healthful life, is that when I remake a recipe that is safe for me to eat; more often than not, I enjoy it even MORE than the original. So, I cracked them eggs and got my quiche on. 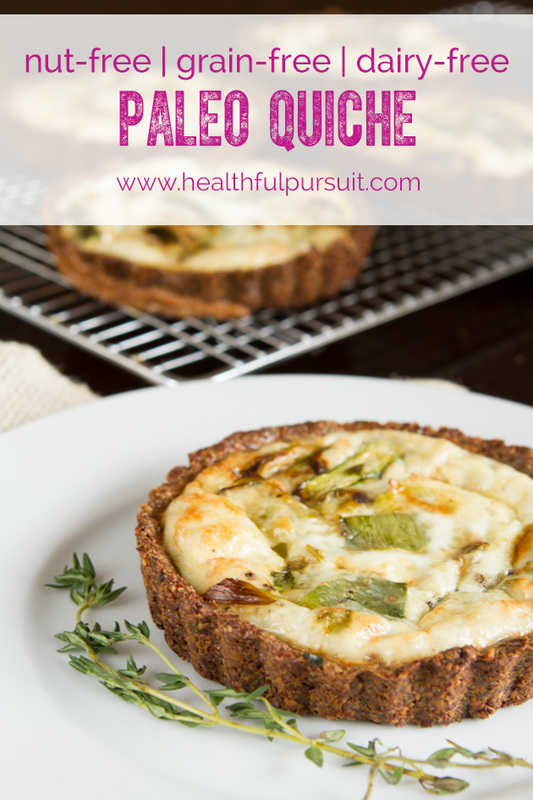 I am a LOVER of all things paleo quiche! 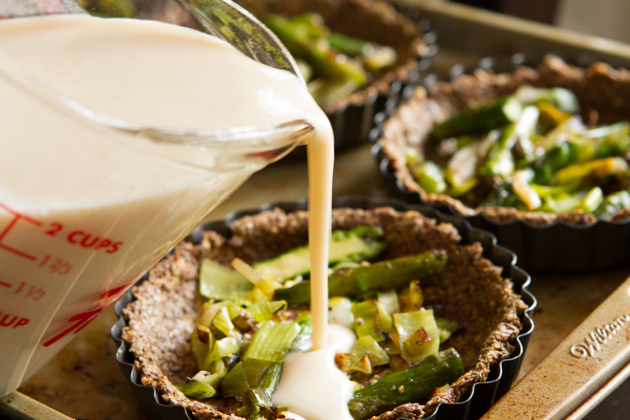 Preheat oven to 225F and lightly oil 6, 3-inch tart pans with a dab of coconut oil. Place each on a baking sheet and set aside. 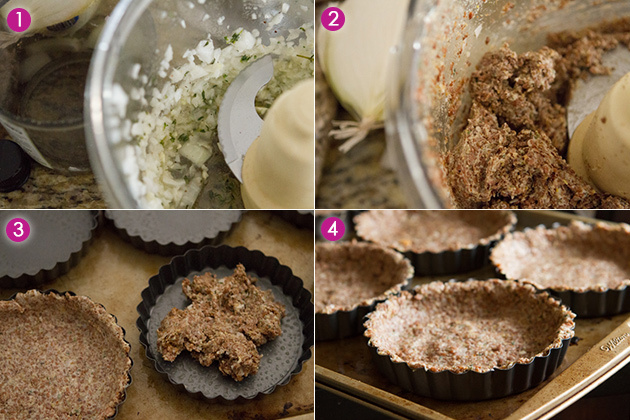 Add onion, garlic, oil, thyme, salt and pepper to the bowl of your food processor. Process until smooth. Add remaining ingredients and process until mixed through. Transfer mixture to each tart pan and mold into the pans, pressing up the edges. Bake for 1 hour and 30 minutes. When finished, remove from the oven and set aside. Adjust oven to 350F. Meanwhile, heat coconut oil in a medium-sized frying pan on medium heat. Add leek, asparagus, salt and pepper and saute for 8 to 10 minutes, until golden. Remove from heat and set aside. Whisk eggs, coconut milk and nutmeg in a small bowl. Transfer cooked asparagus mixture to the cooked crust, then pour egg mixture over top. Cook in 350F oven for 30-35 minutes until tops are lightly brown. Allow to sit for 10 minutes before serving. Full-fat coconut milk: if you are concerned with the fat content of this recipe, you can replace full-fat coconut milk with lite coconut milk or another dairy-free milk of your choice. 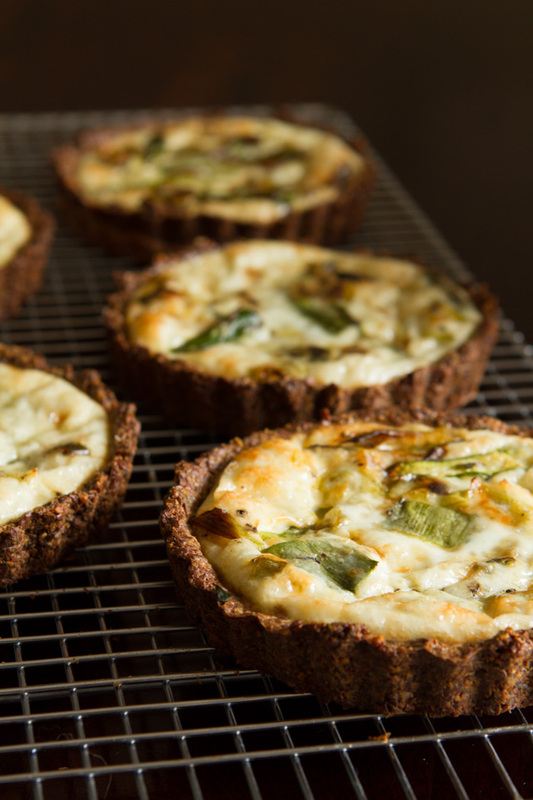 The beauty of quiche is its versatility, making it an ideal recipe for families looking to eat a diet free of genetically modified ingredients. When selecting vegetables for quiche, source locally grown, organic or Non-GMO labeled items for the cleanest, safest meal. You can have fun with it. Just about any veggie will do. Heck, you could even add roasted pears, apples or figs into the mix. 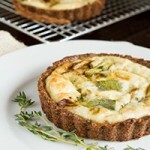 Although I haven’t tried it, I am sure you could make one giant quiche in a pie pan that the whole family could share. I like the look of the individual tarts, but do whatever you’d like! If you go this route, I would recommend adding baking time. Is there one recipe from your childhood that you’ve vowed never to eat/make again? Tell me what it is!